Bega Valley Shire Library together with Four Winds and the Australian National Academy of Music (ANAM) will offer children an inspiring and creative Musical Storytime at Tura Marrang, Bermagui and Bega libraries in September. 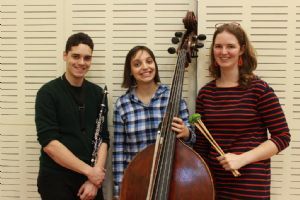 A group of students from the ANAM - Paper Plane Trio, will introduce children aged two to five years to the sounds of the double bass, clarinet and percussion instruments. Programs and Partnerships Officer, Scott Baker said it will be a storytime extravaganza. “Children will make butterfly wings so they can interact with the musical story of The Hungry Caterpillar, but there is more than just fun at play here,” he said. Music is a powerful teacher for young children. It enhances memories, assists speech development and extends their vocabulary. “We are lucky to play host to some of Australia’s best up and coming musicians, who will extend this classic story with their musical accompaniment,” Mr Baker said. The Paper Plane Trio consists of Thea Rosen, Kinga Janiszewski and Luke Carbon who are all current students at the ANAM. Thea Rosen is a percussionist and has been awarded a number of prizes for her solo recitals including ANAM Most Outstanding Performance and Best Program. She has also given recitals in the United Kingdom and Europe and performed in the Perth and Melbourne International Arts Festivals. Kinga Janiszewski plays double bass and has performed with the Canberra Symphony Orchestra and has been part of the Australian Youth Orchestra since 2010. Luke Carbon is a woodwind multi-instrumentalist and will be playing clarinet with the Paper Plane Trio. He has performed with the Melbourne Symphony Orchestra and Victorian Opera, and has been recorded on clarinet and saxophone for radio and television broadcasts. The Musical Storytime will be held from 10.30am – 11.30am at Tura Marrang Library on Monday 19 September, Bermagui Library on Tuesday 20 September and Bega Library on Thursday 22 September. Storytime is free and everyone is welcome to come along. For more information please contact Scott Baker at Bega library on 6499 2127.